Length includes the unconstructed portion of I-210. Route 210, consisting of the contiguous segments of Interstate 210 (I-210) and State Route 210 (SR 210) forming the Foothill Freeway, is a major east–west state highway in the Greater Los Angeles urban area of the U.S. state of California. The western portion of the route is an auxiliary Interstate Highway, while the eastern portion is a state highway. The portion between I-5 and State Route 259 was upgraded to Interstate Highway standards by 2007, but the eastern segment remains signed as a state route because the portion between State Route 259 and I-10 does not meet Interstate Highway standards. The name Foothill Freeway is a reference to Foothill Boulevard and the San Gabriel Mountains, both of which the freeway runs parallel to for most of its length. The freeway connects Los Angeles with its northern suburbs following the foothills of these mountains. The freeway runs from the Sylmar district of Los Angeles east to Redlands. Currently, all of the Foothill Freeway is designated Route 210. Historically, the Foothill Freeway spanned multiple numerical designations. Additionally, the I-210 designation has changed routings, previously including a portion of what is now the Orange Freeway (SR 57). The junction with SR 57 in Glendora is now where Route 210's designation changes from Interstate to state highway. East of Pasadena, the Foothill Freeway parallels, and in some parts replaced, the route of former U.S. Route 66. I-210 in La Crescenta-Montrose, below Mount Lukens. Intersection with Glendale Freeway at lower right-center. I-210's western terminus is at its junction with the Golden State Freeway (I-5), near the Sylmar district of Los Angeles. From that point, the freeway's alignment is generally diagonal as it heads southeast through the northeastern San Fernando Valley and the Crescenta Valley. After leaving Los Angeles, it enters northern Glendale and meets with the Glendale Freeway (State Route 2) before turning due south towards the junction with the Ventura Freeway (State Route 134) in Pasadena. At this interchange, the Foothill Freeway shifts its alignment and direction, becoming an east-west freeway. From the north, the primary through lanes of I-210 become the unsigned northern stub of unfinished I-710, while from the east, the through lanes of the Ventura Freeway become I-210 as the Ventura Freeway reaches its official eastern terminus. After intersecting the northern terminus of I-605 (the San Gabriel River Freeway), I-210 then continues east to the Orange Freeway (State Route 57) in Glendora. Heading east from the Orange Freeway interchange, until its eastern terminus at I-10 in Redlands, 210 is currently signed as a state route. Elevated portion of freeway in Monrovia. The western freeway segment serves as the easternmost portion of the Foothill Freeway (Interstate 210). Consisting of newer freeway, beginning at the east end of I-210 near San Dimas, SR 210 extends eastward, eventually paralleling Highland Avenue, as it continues through Fontana. It intersects Interstate 15, an artery between Southern California and Nevada, about ten miles before it meets with Interstate 215 in San Bernardino. The segment east of Interstate 215 is the former alignment of State Route 30. This segment extends eastward to junctions with Interstate 215, State Route 259, State Route 18 and State Route 330 in Highland. State Route 210 then curves southward and ends in a junction with Interstate 10 in Redlands. The 210 in La Cañada Flintridge. Jet Propulsion Laboratory on the right. The Glendora Curve is the former colloquial name for the interchange between State Route 57 and the Foothill Freeway, Interstate 210. The "curve" portion refers to the interchange from the northbound lanes of State Route 57 to the westbound lanes of I-210, and from the eastbound lanes of I-210 to the southbound lanes of State Route 57. The origin of the name comes from its location in the city of Glendora. Prior to 2002, this interchange was entirely part of I-210, and the eastern terminus of I-210 ended several miles south of the curve at the Kellogg Interchange at the junctions of the Chino Valley Freeway, State Route 71, the San Bernardino Freeway, I-10, and Route 57. After the portion of I-210 south of the Glendora Curve was transferred to Route 57 in 2002, effectively extending Route 210 east past the Glendora Curve, the name Glendora Curve fell out of popular use. Route 210 is part of the California Freeway and Expressway System, and is part of the National Highway System, a network of highways that are considered essential to the country's economy, defense, and mobility by the Federal Highway Administration. Route 210 is eligible for the State Scenic Highway System, but it is not officially designated as a scenic highway by the California Department of Transportation. Route 210 from Route 5 to Route 10 in Redlands is known as the Foothill Freeway, as named by Senate Concurrent Resolution 29, Chapter 128 in 1991. 1955 map of the planned Interstates in the Greater Los Angeles Area. The original proposal for present-day I-210 includes its original eastern terminus in Pomona. Construction began on the freeway in 1958. The first section, starting at the eastern end of Foothill Boulevard in what is now La Cañada Flintridge, and going across the Arroyo Seco near Devil's Gate Dam to Canada Avenue in Pasadena, was opened in 1966; it was then signed as State Route 118. The section going northwest from Pasadena through La Canada Flintridge to the junction with I-5 in Sylmar was built in several stages between 1971 and 1977. The first section to open was between Ocean View Boulevard and Lowell Avenue in La Crescenta, in July, 1972, followed in November by the section between Berkshire Avenue and Ocean View in La Cañada Flintridge. The section of freeway in Sylmar, California that was intended to open first (between Interstate 5 and MacClay Avenue) was damaged by the 1971 Sylmar Earthquake, and the opening was delayed until repairs could be completed in 1973. In the Pasadena, California section, a bridge span traversing the Arroyo Seco collapsed during construction on October 17, 1972, killing six workers, and as a result, the northbound section through Pasadena was not fully opened until 1974. The last section in the San Fernando Valley to be completed was between Highway 118 in Lake View Terrace, and Lowell Avenue in La Crescenta. While this section was largely completed by 1976, the portion between Sun Valley Boulevard and Wheatland Avenue (traversing the Tujunga Wash) was not fully completed until 1981. From 1976 to 1980, the uncompleted section of Interstate 210 (notably near the intersection of Highway 118, near the Paxton Street exit) was rented by Columbia Pictures Television for the filming of the television series, CHiPs. In 1968, the Atchison, Topeka and Santa Fe Railway depot at Santa Anita, a historic structure built in 1890, was moved to the Los Angeles County Arboretum and Botanic Garden to make way for a section of the freeway passing through Arcadia. Construction of the freeway through Pasadena and Arcadia prompted the realignment and relocation of the railroad's mainline to the freeway's median, with the former mainline trackage between Sierra Bonita and Kinneloa avenues in Pasadena becoming an industrial spur accessed via an underpass below the freeway's eastbound lanes. The "Pasadena" section from State Route 134 to Rosemead Boulevard was completed in 1976, while the section from Arcadia, California to the Kellogg Interchange with Interstate 10 at Pomona had been previously completed in 1971. The section between the Kellogg interchange and Glendora is no longer part of I-210. In 2003, this piece was renumbered as part of State Route 57, known as the Orange Freeway. In the 1990s, Caltrans began constructing extensions to the freeway from Glendora east to the former Interstate 215/State Route 30 interchange in San Bernardino. In 2003, a 20-mile (32 km) segment east from Glendora to Fontana was completed, with the portion proceeding south from Glendora renumbered SR 57. The remaining section east of Interstate 15 between Fontana and Interstate 215 was opened on July 24, 2007. Caltrans has petitioned AASHTO, the trade organization that oversees the designation and naming of the Interstate Highway system, to re-sign the entire Foothill Freeway, including the entire segments of State routes 210 and 30, as I-210. Upon completion of the new freeway segment west of I-215, State Route 30 from I-215 to I-10 in Redlands was re-signed as State Route 210. The re-signing in 2003 of the former portion of I-210 now signed as State Route 57 truncated I-210 from its parent route, I-10. Presuming that authority is given at some point in the future to re-sign the entirety of 210 as an interstate, I-210 will once again connect to its parent route, but much farther east in Redlands. 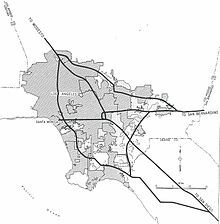 The western freeway segment, planned since the 1970s and completed in 2002, replaced a western surface street segment that began with Base Line Road (sometimes spelled Baseline Road) at its intersection with Foothill Boulevard in La Verne and extended eastward into Upland. In Upland it became 16th Street, then turned northward onto Mountain Avenue, then turned eastward onto 19th Street. It left Upland and continued eastward into Rancho Cucamonga. After Haven Ave in Rancho Cucamonga, 19th Street curves north, and becomes Highland Ave, which still exists in some areas although in pieces due to the freeway overlapping onto Highland Ave, such as the eastbound on and off ramps for Milliken Ave. Highland Ave deviates from the original SR 30 alignment at Etiwanda Ave when it curves south and ends at East Ave, the border of Rancho Cucamonga and Fontana. Highland Ave starts again at Cherry Ave, east of the I-15 and continue east, becoming W. Easton Ave at Alder Ave. Shortly afterwards, it makes a sharp left curve at Riverside Ave, crossing over the freeway and becoming Highland Ave again. From here, it leaves Rialto and goes into San Bernardino. It crosses under SR 210, I-215, and SR 259 before entering the city of Highland. In Highland, the original SR 30 crosses under the 210 one last time and ends as it crosses over SR 330. Some maps still show part of this route as SR 30. State Route 30 was the former designation of State Route 210 and State Route 330. Route 30 ran from its interchange with I-210 in Glendora east to State Route 18 at Big Bear Lake. The easternmost portion of Route 30 was transferred to Route 330 in 1972. Thereafter, Route 30 was routed south to I-10 in Redlands. In 1999, the entirety of Route 30 from the Glendora Curve to Redlands was transferred to Route 210. SR 30 was adopted as a state route in 1933 as part of Legislative Route 190. It was an unsigned highway, running from LRN 9 (formerly US 66, Foothill Blvd) near San Dimas to LRN 26 (SR 38) near Redlands. It also ran from LRN 26 near Redlands to LRN 43 near Big Bear Lake, which would become part of SR 38. During the renumbering of California routes, LRN 190 was split into two different routes. The western portion, between I-210 in San Dimas and Highland became SR 30. The eastern portion, between SR 38 in Redlands and Highland was combined with LRN 207 (currently SR 330) to form SR 106. In 1972, the northern portion of SR 106, between SR 30 and SR 18 would be renumbered SR 330. The southern portion, between SR 30 and I-10 (SR 106 was moved to I-10 in 1965) was combined with SR 30. Initial freeway construction started in 1968, and constructed the freeway between SR 259 and Cedar St. in San Bernardino. Construction continued east in 1971, which brought the freeway just west of SR 330. Construction did not resume until 1989 which extended the freeway west to I-215. The last phase of construction started in 1992, which connected the route south to I-10. In 1968, the State requested that SR 30 be incorporated into the Interstate system, but was declined. The next effort started in 1998. The State decided to close the 25-mile gap between I-210 and SR 30. It also decided to number the new freeway as SR 210, in preparation of the route becoming an interstate. Also, when the new freeway was close to the existing route, the entire route would be renumbered SR 210. In addition, the short section of the Orange Freeway, which was numbered I-210, would be renumbered SR 57 to match the number used for the rest of the freeway. Construction started on the eastern end from Foothill Boulevard (Exit 47), and slowly moved east. In 2007, the mainline freeway section was completed, which ended the existence of SR 30. The final phase of the Foothill Freeway project involved the completion of the interchange with I-215 (Exit 74). When the Foothill Freeway mainline was completed in 2007, Exit 74 had only four of its six ramps built, missing moves from SR 210 EB to I-215 SB and from I-215 NB to SR 210 WB. The flyover plans for these moves had to be recast to address potential soil liquefaction in the event of rupture of existing or undiscovered faults in the area during an earthquake; this project was separated from the main 210 project to avoid delaying the latter. Completion of Exit 74 was also tied to the widening and improving of I-215 in the area. The flyover from northbound I-215 to westbound SR 210 opened on December 22, 2011, while the eastbound SR 210 to southbound I-215 opened on July 23, 2012, thus completing the interchange. — SR 134 west (Ventura Freeway) – Ventura Westbound exit and eastbound entrance; eastern terminus of SR 134/Ventura Fwy. ^ California Department of Transportation. "State Truck Route List". Sacramento: California Department of Transportation. Archived from the original (XLS file) on June 30, 2015. Retrieved June 30, 2015. ^ a b c California Department of Transportation (July 2009). "Log of Bridges on State Highways". Sacramento: California Department of Transportation. ^ "Why isn't the new section of the 210 Freeway called Interstate 210?". The Press-Enterprise. September 16, 2018. Retrieved March 24, 2019. ^ Federal Highway Administration (March 25, 2015). National Highway System: Los Angeles, CA (PDF) (Map). Scale not given. Washington, DC: Federal Highway Administration. Retrieved September 15, 2017. Federal Highway Administration (March 25, 2015). National Highway System: Riverside–San Bernardino, CA (PDF) (Map). Scale not given. Washington, DC: Federal Highway Administration. Retrieved September 15, 2017. ^ California Department of Transportation (September 7, 2011). "Officially Designated State Scenic Highways and Historic Parkways". Sacramento: California Department of Transportation. Retrieved September 15, 2017. ^ California Department of Transportation; California State Transportation Agency (January 2015). 2014 Named Freeways, Highways, Structures and Other Appurtenances in California. Sacramento: California Department of Transportation. p. 84. Archived from the original (PDF) on May 30, 2015. Retrieved May 30, 2015. ^ "Early California History" (PDF). Los Angeles County Arboretum & Botanic Garden. Archived from the original (PDF) on 2010-12-24. Retrieved 2009-09-09. ^ "Caminos – Newsletter of the Arcadia Historical Society" (PDF). Arcadia Historical society. July 2007. Archived from the original (PDF) on 2011-06-08. Retrieved 2009-09-09. ^ Route 185-192. CAHighway.org. Accessed: 03-05-2010. ^ Route 105-112. CAHighway.org. Accessed: 03-05-2010. ^ a b Route 25-32. CAHighway.org. Accessed: 03-05-2010. ^ I-215 North SR 210/215 Connector Project Fact Sheet Archived 2009-11-17 at the Wayback Machine. Caltrans. Accessed 03-05-2010. ^ I-215 Project [@215NEWS] (23 December 2011). "GREAT NEWS! NB #I215/ WB #SR210 Connector now OPEN to commuters! Drive and enjoy!" (Tweet) – via Twitter. ^ I-215 Project [@215NEWS] (23 July 2012). "Great news! EB SR-210 to SB I-215 connector and SB Mt. Vernon Ave./27th St. on-ramp are now open!" (Tweet) – via Twitter. ^ a b Warring, KS (April 18, 2008). "Route 210 Freeway Interchanges" (PDF). California Numbered Exit Uniform System. California Department of Transportation. Retrieved September 1, 2014. Wikimedia Commons has media related to Interstate 210 and State Route 210 (California). This page was last edited on 9 April 2019, at 22:12 (UTC).